Have a question for Hasbro? Ask it Now and Get an Answer! Q&A Video! Hasbro will be doing a Q & A at the Fair on Saturday and has asked that I collect questions from the MLP Community. If you will be attending the Fair, and would like to ask your question (if it is choosen) write something like "I'll be at the Fair and would like to ask this question" after your question. I'll be compiling the questions and sending them to Hasbro on Monday (6-13-11) So get those questions in before Monday! Is the first season of MLP FiM going to be released on DVD anytime soon? Will they release more of the hard plastic figures like the gift-pack set with Celestia, Pinkie Pie, Spike, and Twilight? I'm just hoping they'd release Fluttershy, Rainbow Dash, Rarity and maybe Luna like that. Or maybe an online exclusive WHITE Celestia? Because then fans could stop whining about her being so pink, while not having to worry about what stores will want. Since it was said stores like to buy stuff in pink for girls, but if it's through their own online store..
Also, the ever important question. BOYS!!! When will we get a toy of Big Macintosh? I Love Collecting My Little Ponys! [SIGPIC][/SIGPIC]Thanks for the siggy LLBPonyGirl!!!! I have another question I'd love to ask! Will we get a soundtrack of the new series? Maybe with a re-recorded version of the Cutie Mark Crusaders song? or a full length version of 'Equestria Girls'? I'm not talking a Cd just on iTune either, I mean one I can hold, one I'd have to buy in a store. iTunes would be great for people too, but I prefer CDs. I want to know if they have any plans on producing boy ponies for the G4 toyline. Are you aware of the massive internet following Friendship is Magic has? If so, do you have any plans to cater towards the "Bronies"? Here are my questions. Feel free to edit in any way you see fit. Thanks for giving us the chance to submit questions to Hasbro, you are so awesome! And good luck at the fair this year, I wish I could go, but I won't make it. 1.) Does Hasbro have anything planned for the 30th Anniversary in 2013? 2.) As far as we know, will the annual MLP fair be invited for activities and tours at the Hasbro offices in Rhode Island every year, or only on special occasions? 3.) Now that the G3 line is over, will Hasbro be allowed to release any molds/prototypes/photos/info about the G3s? We'd love to see something released that wasn't able before with the line still going on? 4.) Will some of these G4 ponies that we are seeing on Chinese auction sites such as TaoBao be released? Is there any chance we could be warned if any characters will be country-exclusives? 5.) Will there be a chance that in the future we can get the exclusives/Art ponies in the G4 mold- at least one? 6.) How closely do the animators of the Hub show and the toy designers from Hasbro work together, if at all? 7.) We have been informed that the creator of the Hub show, Lauren Faust, had to purchase some pony toys off Ebay. Is she not given any oversight into the creation of the toys? Furthermore, is there a main reason that some of the toys are not true to the show characters, such as Applejack's freckles or more importantly Princess Celestia's body color? 8.) Are there any special plans for merchandising for adult fans of the show/toy line? 9.) We've gotten the Shine Bright ponies, clear keychains, and transparent, glittery Blind Bag ponies. 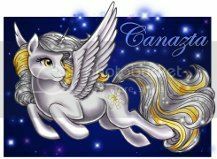 Is there a good chance we can see some transparent or glittery versions of the new G4 characters in regular pony toy form? Hint, hint! We love this type of stuff! 10.) Pictures of exclusives have been leaked, including the Egyptian themed Art/Comicon/Exclusive and the Purple and black exclusive. Can anything about them be confirmed? Also, can you tell us if the purple and black one is glow-in-the-dark or transparent at all? That's it for now, but I'm sure I'll think of more later! wow what a great opportunity, thanks so much for extending this offer to folks who aren't even in the same Country as the Toy Fair! Are they going to be releasing more characters that are actually canon to the series "Friendship is Magic" ? I see lots of new pink unicorns that I've never seen on the show, all molded in the exact same poses, but what about the non-pony characters that have made so many folks more excited for this series? Such as, but not limited to: Zecora, Little Strongheart, and Gilda Griffon? I'd also love to know if they're planning a Trixie doll, or- my #1 gripe: are they EVER going to make a princess Celestia that actually LOOKS like princess Celestia? I've avoided buying her because she just doesn't look like her character on the show at all, it's a real drag. Hasbro should be told that accuracy IS important when pleasing a collector, especially if they have a specific design in an animated series. And also, if they really think pink ponies sell better, they are very wrong! I'd MUCH rather see a larger 'basic' figure of the brown pony Cherry Spices than yet another pink pony. If the deluxe Princess Celestia with real hair had been white with the gold on her hooves, I'd have bought it up in a heartbeat. 1) Can there be explanation for the timing of the initial release/distribution of the G4 pony toys? For example, the "My Little Pony: Friendship is Magic" animated series came out on TV in fall of 2010, but why is it that not too many stores had the G4 pony toys in stock until January or February 2011 (and the stores which had it in stock were very limited)--thus being a lot later than when the TV series came out, and missing out on the Christmas shopping opportunity? 2) Why did not too many stores have Wave 2 of the G4 series (with Lily Blossom and Cheerilee), and will more stores receive them soon? And when will we see the newer ponies like Cupcake, Dewdrop Dazzle, and Lulu Luck in the stores? 3) What's the story behind the Ribbons and Hearts breast cancer awareness pony that has been showing up in Chinese internet stores and on eBay? Will the Ribbons and Hearts breast cancer awareness pony ever be available for general release in stores (or even be an event exclusive, for that matter)? 4) Will there be toys made of the G4 boy ponies--such as Big Brother Macintosh, or Princess Celestia's nephew? 5) Will there be a toy made of baby Scootaloo? And will there be more baby ponies made? 6) Will there be more G4 ponies made that are NOT pink or purple/lavender? Thanks to Poneerific for Glory and Medley! Thanks so much for your questions everypony! I'll be sending them off to Hasbro in the morning. Heck yes! I saw on Equestria Daily there's a video upload of the Hasbro Q&A session and they answered some of my questions! Sweet! I know Sweet Tune usually films this too, so I wonder if she'll have an upload for us too! Ooooh! Thanks for sharing those vids ^_^ Not that much of that has anything to do with Hasbro Australia right now but still very exciting! Yeah, that made me twitch. How could that even be possible... and for heaven sakes, she is a main character. I assume that means no plans for the end of 2011, but hopefully 2012? I mean there is a prototype out there...... (the one that was "mispackaged" with sweetiebelle). Yeah, the little Scootaloo was adorable!! But I saw my question get answered!! The one about the gift pack part two with Rainbow Dash, Fluttershy, Rarity and Luna/Nightmare Moon. Sad they didn't sell well enough for a part 2.. I like the little figures with solid hair! Though I think we are getting some conflicting reports here too, they said in the Q&A that there were no plans for the blind bags, but we got reports earlier from Hasbro that the blind bags were coming.....and how could they get Tales mixed with Friendship is Magic? !00)00)00)I really want that series on DVD!! What was the url that the lady in the pink shirt said was for junior's tees? I couldn't really understand what she said. Ohmigosh I just died a little bit. It's BEAUTIFUL!!!! !